Please allow me to take this opportunity to welcome you and your family to South Pointe. South Pointe is a mature collection of nicely cared for homes, well-maintained common areas and conscientious homeowners. Many of us have lived here for a decade or more and our children have attended area schools and grown up playing in the neighborhood. Our younger families are also discovering that South Pointe is a great place to raise their children. It is truly a diverse and wonderful place to live where all are welcome! 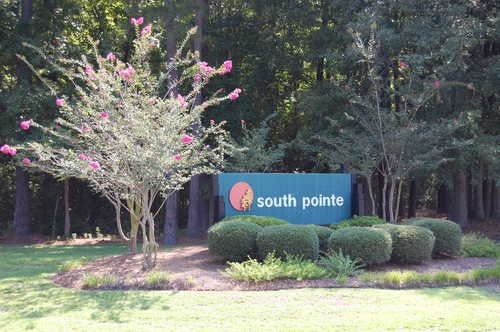 South Pointe’s HOA is responsible for maintaining the front entrance to the subdivision as well as the boulevard the tennis courts and recreation field adjacent to the courts and McDougal Circle. The HOA sponsors events for the children during Easter and Halloween, and an occasional community picnic. The HOA supports a “Yard of the Month” Program and holiday lighting/decorations contest in December. The HOA also supports and maintains a US Flag Memorial which is funded by monetary donations from the residents. The HOA has also come to rely on the many residents who volunteer to assist with the maintenance and upkeep of South Pointe. If you enjoy bike riding, jogging or leisurely walks, the boulevard is marked with white lines for the safety of our residents. The HOA’s monthly fees are currently only ten dollars ($10.00) per month. With these fees, we keep up the maintenance of the boulevard and tennis courts, as well as support the activities for the neighborhood children. In addition, we use these funds to operate our website and provide a semi-annual newsletter among other things listed in our annual budget. For all of these worthwhile reasons, we ask that you support the HOA by paying the voluntary fees and become a registered user of the private website we provide for the convenience of accessing the most up-to-date information, notifications concerning Crime Watch activities and neighborhood discussions and concerns.